Bathroom cabinets – providing a functional yet stylish way of keeping your bathroom belongings out of sight and out of mind, keeping your bathroom calm and looking elegant. The bathroom is more than just an area of rush in the mornings, it’s a place in which you can fully unwind and relax. No one likes to try and relax in a cluttered room, clutter is proven to increase stress so why should you have to put up with it? Keep your surfaces clean and tidy, by putting all your treasures in a beautiful bathroom cabinet. 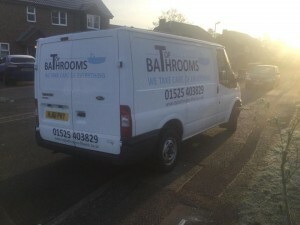 Look out for our van! You can now spot our van around town! Look out for us Bedford and Milton Keynes as we go about delivering top-of-the-range bathroom fittings for some of the best prices in the area. You can now also find us on local directories like the Big Red Directory, so look us up if you want your bathroom fitted quick! look out for our logo! This logo is up and coming, keep your eyes open!